After a series of international friendly matches against Vietnam and Singapore’s most talented youth footballers, the Vanuatu U-20 national team eagerly await the kick-off of their opening match against Mexico on Saturday in the nation’s first ever FIFA U-20 World Cup. The Oceania representatives had a bumpy start to their Asian tour, losing 3-2 to the Singapore U-22 national team at Choa Chu Kang Stadium in Singapore on 1 May. Bong Kalo opened the scoring in the 10th minute of the game, giving Vanuatu the early lead, but their hosts evened the score in the 28th minute and followed it up with a second goal just before the half time whistle. Singapore found the net a third time in the early minutes of the second half but Vanuatu closed the margin in the 75th minute to bring the score to 3-2. Vanuatu battled hard to find the net again but Singapore dominated the last minutes of the game, keeping the ball and goal out of Vanuatu’s reach. The Melanesians redeemed themselves three days later when they held out the U-22 team to a 1-1 draw in their rematch. Vanuatu opened the scoring in the fourth minute of the match but Singapore equalised in the 41st minute, nearly mirroring the first half of their previous clash. Vanuatu were more dominant in the second match however, defending as a team to keep Singapore away from goal for the remainder of the game, keeping possession for large periods and finding themselves in front of Singapore’s goal – unlucky not to convert – several times. Vanuatu’s last encounter against Singapore saw them make tracks to Korea Republic to take on the Singapore U-20 national team, and although the side was a more equal age-group, their 1-1 draw was very hard fought. The game remained scoreless until the 90th minute when Singapore converted a penalty, but a foul in the Singapore box only a minute later saw Bong Kalo standing at the penalty spot for Vanuatu’s last chance in the first minute of additional time. 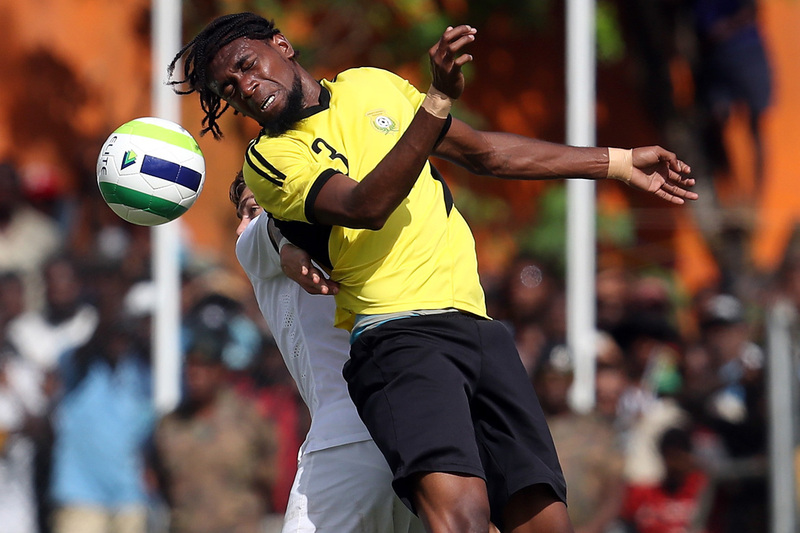 The Vanuatu international fired the ball into the back of the net before the final whistle confirmed a 1-1 draw. The World Cup debutants’ final international friendly match saw them take on fellow competition contenders Vietnam on 14 May. Vietnam – who have been drawn in Group E with Oceania representatives New Zealand – were also inseparable to Vanuatu, following Ronaldo Wilkins’ four minute goal with an equaliser in the 40th minute to secure a 1-1 draw. With players joining Vanuatu in camp only weeks out from the Korea Republic hosted competition, Vanuatu coach Dejan Gluscevic believed the international friendlies were integral to his team’s preparation. “We duplicated the World Cup by playing all the games in a row while in Singapore. This helped us indicate the players who will be able to play this highly demanding and high intensity game schedule at the World Cup,” he said. Central defender Jason Thomas was one of the late editions to the squad, joining the team after competing in the OFC Champions League with his club Erakor Golden Star. “I was a little bit upset about my late arrival. I tried really hard to make myself fit in to the team but I didn’t know if I would make the final squad because of my lateness,” he said. Making the most of his chance to showcase his talent on the field in the Asian friendlies, Thomas managed to impress Gluscevic enough to claim a spot in the squad. “It felt great. I was so proud. I’ve never experienced a world cup and I will use it to make my country proud,” Thomas said. Although Vanuatu haven’t had the same resources or time as their opponents in their build up to the World Cup, Thomas is confident that his team will do their nation and region proud. “We’re not on the same level as them but we’re going to play as a team and try to stay focused,” he said. Vanuatu will play Mexico in their opening Group B match on 20 May before taking on Venezuela on 23 May and Germany on 26 May in the FIFA U-20 World Cup Korea Republic 2017.